Annie comes to the Riverside...so get your tickets now! One of the world’s best-loved musicals comes to the Riverside Theatre, Coleraine, early in 2017 when the award-winning Ballywillan Drama Group present ANNIE for sixteen special performances. Celebrating their 65th Anniversary, Ballywillan have given this famous family musical a complete overhaul from the original 1970’s stage version bringing ANNIE right up to date. Brian Logan, the show’s Director, has assembled a wonderful cast which features many local theatre stars. Because of the sixteen performance run there are two troupes of orphans and two Annies who alternate performances. After an exhaustive audition process that saw literally hundreds of young girls turn up, Amelia Galbraith and Abigail Mairs won through and jointly secured the starring role of Annie. 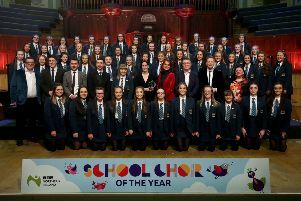 Other principal players include Maxine McAleenon, Niaomh Rodgers, Alan McClarty, Richard Mairs and Kelly Ann McKillen. The ANNIE orchestrations have been updated and refreshed and Musical Director, Eric Boyd, is hard at work rehearsing the eighty strong company in their musical numbers. Sharon Logan, Company Choreographer and Victoria Lagan, Choreographer, have been drilling both adults and children in their various routines. Both children troupes have to be identically trained in order that each team seamlessly fits in with the show’s permanent cast – the choreographers certainly have their work cut out! Costume Designer, Ewan Campbell, from Utopia Costumes in Scotland is busy designing and making the hundreds of costumes required for this iconic musical. The standard ANNIE costumes that costumiers hire out to music societies are of no use as Brian Logan has reimagined the entire production, giving it a bright new look which means a completely redesigned set of costumes must be produced. Brian has also been responsible for designing the sets and scenery and, again, his designs are as far away from the standard ANNIE scenery as it is possible to be. His designs play homage to the roots of the original 1930’s cartoon strip Orphan Annie and the various landmark cinematic productions of the musical over the years. Specsavers, Coleraine, have been announced as Principal Show Sponsors for the next three years which sees this prestigious local business supporting Ballywillan’s main show until 2019. ANNIE is now booking at the Riverside Theatre on 028 70 123 123 or book on-line at . The musical runs for sixteen performances from Thursday 19 January to Saturday 4 February 2017 with evening and matinee performances. There is also an attractive range of ticket offers and concessions, including a School Offer and Family Packages.